In many ways, Surf Cup is an unofficial National Championship, as the best teams from all around the country come to compete for the title. We at SRFC were fortunate enough to have a team qualify for the event. 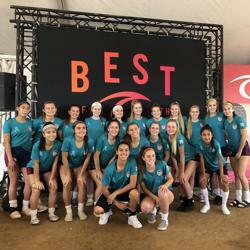 The girls ended up competing in the Super White bracket, which was full of the very best ECNL teams; all of them ranked in the top 50 in the nation. SRFC 2002G not only competed against the best teams in the country but ended up making it to the finals! In our first game, we played against an ECNL team, Pride FC, the No 1 team in Colorado and 40th in the nation. We won 2:1. In our second game, we played against an ECNL team, LA Breakers, the No 3 team in Southern California and 22nd in the nation. We tied 1:1. In our third game, we played against the GPS all-star team, which consisted of the very best players from all of the GPS affiliated clubs in the nation. We won 4:2. We finished our bracket with 7 points and qualified for the semi-finals. In that semi-final match, we were the 4th seed and played against the 1st seeded team. The No1 seed team was Leahi SC from Hawaii, the No1 team in Hawaii and one of the top teams in the country. We won 3:1. In the finals later that afternoon, it so happened that we again played against the same ECNL team we saw in the group stage, the LA Breakers. We lost 1:0. We should all be extremely proud of the 2002 group and this accomplishment. It is one of the best - if not the best result - in the history of the SRFC girls program. We are really proud SRFC gained national recognition as an elite club through our performance, and we opened the doors for future generations of teams from our club to attend this amazing event. We had 50+ college coaches from all over the country attending our matches: Coaches who are now recruiting players for their colleges. This result for our 2002 Girls team did not come overnight. The team worked extremely hard to get to this level of play, and their journey started years ago when they were a bronze-level team. There is a number of players who played on 2nd and 3rd teams for years before they were ready to join the 02G NPL team. Now they are some of our best players. To achieve this type of a result, it all starts with players/families staying together through the tough times, and recognizing that SRFC is able to provide them with everything they need to be successful. For all of us at SRFC, this experience should serve as a proof of concept that the ECNL status is not a guarantee of quality and it is certainly not a guarantee of player development. It also proves that you have everything you need to succeed right here at SRFC. We have proven our ability to develop players, and our ability to place players in college. More then anything this result proves that SRFC is on the right track. As an organization, we are reaching new heights every day. In its core, SRFC is about player development, not player recruitment! There is a fundamental difference between the two concepts. The first one is about players getting better within the system, and the second one is about recruiting players from outside the system to make the system what it is. As the Girls Technical Director, I am happy to tell you that we have one of the best coaching staffs in Northern California, and your/our players will be well taken care of. Four years ago, our 2002 Girls played in the Vegas Showcase and lost to the same Hawaii Leahi team 6:0. Our team stayed together, worked really hard, believed they could do it and went on to do it! I hope this experience marks a new era in our club, an era in which SRFC players/families are honored to be a part our club/community, and wear the club's colors with pride!